Claims that a destabilising ‘arms race’ is underway in the Asia–Pacific  have become commonplace and are supported by reports that regional defence spending has surpassed Europe for the third consecutive year. As my ASPI report  released today shows, the corollary of this situation is intensifying naval competition in the region. The implications for Australia and the Australian Defence Force (ADF) are significant. Maritime disputes between China and its neighbours have increased tensions and affected countries’ military modernisation programs. These tensions have driven the requirement for greater surveillance capabilities and signals intelligence systems as well as more surface combatants with longer endurance and platforms able to launch anti-ship missiles, submarines, and long-range aircraft. These disputes occur in the context of heightened uncertainty about the future distribution of regional power, particularly between the US and China. Consequently, regional naval arms decisions are increasingly driven by ‘action–reaction’ dynamics —reciprocal dynamics in which developments in offensive and defensive capabilities become an interactive process in which the arms requirements of one party depend upon the known, assumed or anticipated capabilities of the forces of other parties; Those dynamics are manifested in counter-reaction (where one party responds to another’s capabilities) and mirror-reaction (where a party imitates another’s capabilities). In other words, these dynamics display some of the important characteristics of an arms race and show that the Asia–Pacific maritime zone is indeed becoming more contested, and potentially more volatile. Obviously, there are regional differences between Northeast Asia and Southeast Asia. Naval ‘action–reaction’ dynamics are most clearly visible in Northeast Asia. It should be noted that a common argument (see for instance here ) against the emergence of naval arms races or serious competition in Asia is that defence spending as a percentage of GDP remains rather modest in most countries. That’s also true for northeast Asian countries. However, this measure doesn’t take into account the real value amount, nor does it consider the sophistication or type of the defence equipment acquired by individual countries. Doing so paints a different picture, one that shows that China, Japan, South Korea and Taiwan are increasingly reacting to each other’s capabilities and modernisation efforts. US capabilities are a key factor in this equation as well. The picture in Southeast Asia is more complex. The South China Sea has dominated strategic rationales for increasing capabilities, particularly submarines. Since 2012 the number of naval platforms in many countries decreased while military expenditure continued to climb, indicating substantial efforts to modernise and invest in fewer but more capable systems. Despite these efforts, Southeast Asian countries (with the exception of Singapore) haven’t yet worked out how to develop, operate and sustain sophisticated capabilities. Should the ADF deploy to Southeast Asia in the future, it could face more sophisticated capabilities. While the ADF won’t lose its ‘capability edge’ in Southeast Asia in the medium term, in the short term investments in certain platforms increase the chance of a ‘lucky punch’. For instance, Indonesia is testing supersonic missiles from its frigates and putting Chinese anti-ship cruise missiles on fast attack craft. With rising economic growth, Southeast Asian countries will better address problems such as maintenance and logistics and increase their combat capability through improved situational awareness and better command and control systems. The dynamics of regional naval modernisation indicate that the future security environment in the Western Pacific will only become more contested. Northeast Asia is already caught up in action–reaction dynamics. Maritime Southeast Asia might follow suit over time. Importantly, while not imminent, the ADF’s key tenet of being a technologically superior force in Southeast Asia will gradually be eroded, at least in certain capability areas. The upcoming Defence White Paper will need to address how the ADF will modernise its own air and maritime capabilities in a neighbourhood that’s becoming more complex. It also means that we need to invest even more in building sustainable regional defence partnerships and further strengthening our US alliance. Sheryn Lee is an Associate Lecturer in Security Studies at Macquarie University, and a PhD Candidate at the Strategic and Defence Studies Centre, the Australian National University. 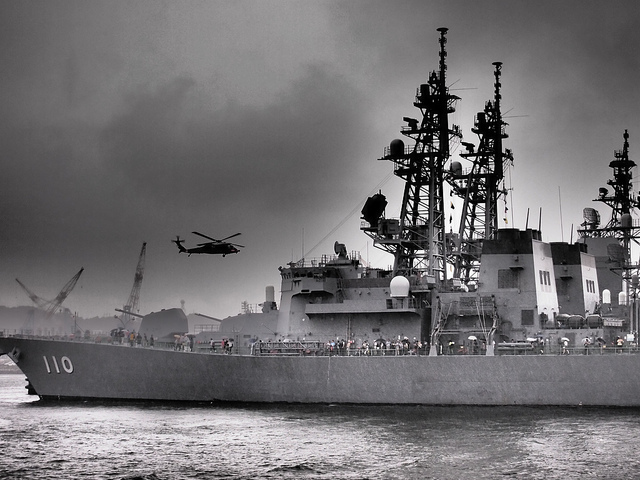 Image courtesy of Flickr user Japan Maritime Self Defense Force.